On the other hand, there are so many paranormal stories about the ghosts of the late loves who walk around the people, looking for their love. According to those stories, the ghosts like to take with them their love, even though that could mean death for their love ones. Those stories are rather spooky but we all remember the story about the corpse’s wife which is one of the most beautiful love stories ever! Mika and Aiko are a married couple whose passion are exactly those paranormal stories, or more concretely, the Japanese paranormal stories. In this moment they are at the samurai’s temple, exploring one unusual story. There, almost every night, appears the spirit a woman whose husband – the samurai, has died in the battle field. Mika and Akio like to help the wife’s spirit find the grave that belongs to her greatest love, her late husband, so they could be together once and for all. This woman’s ghosts needs to settle down so let’s help her fulfill her romantic mission. 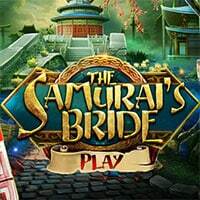 The Samurai’s Bride is a free online hidden object game on Hidden4Fun.